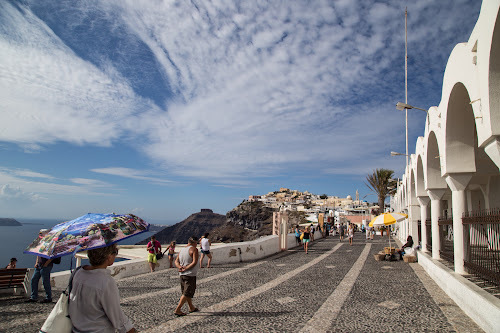 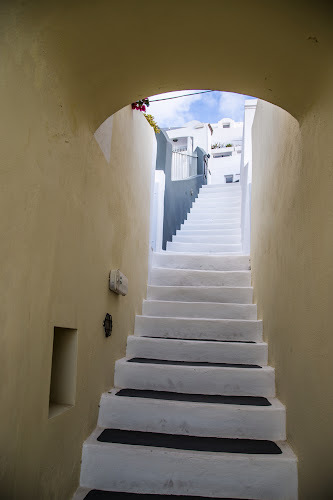 The next day we checked out of our hotel and headed to the town of Fira. 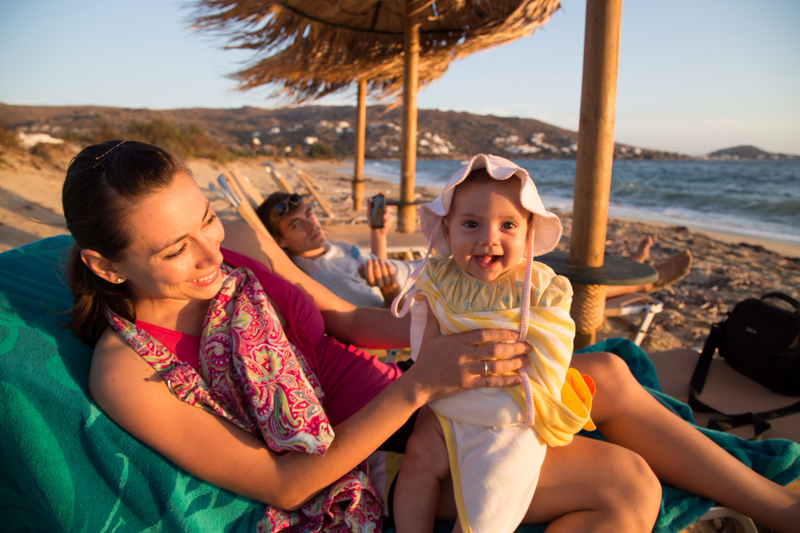 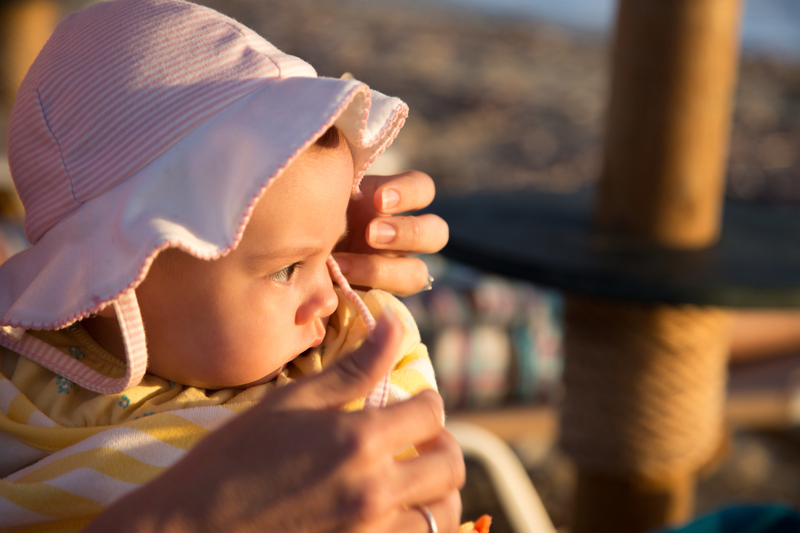 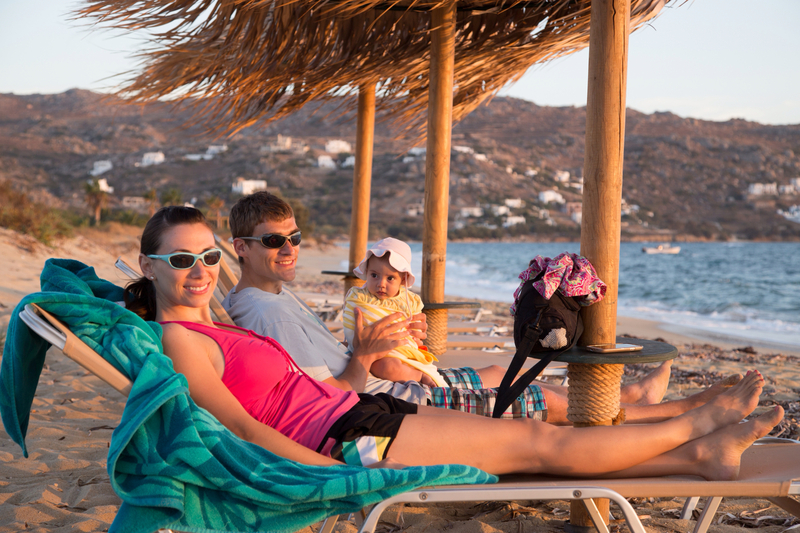 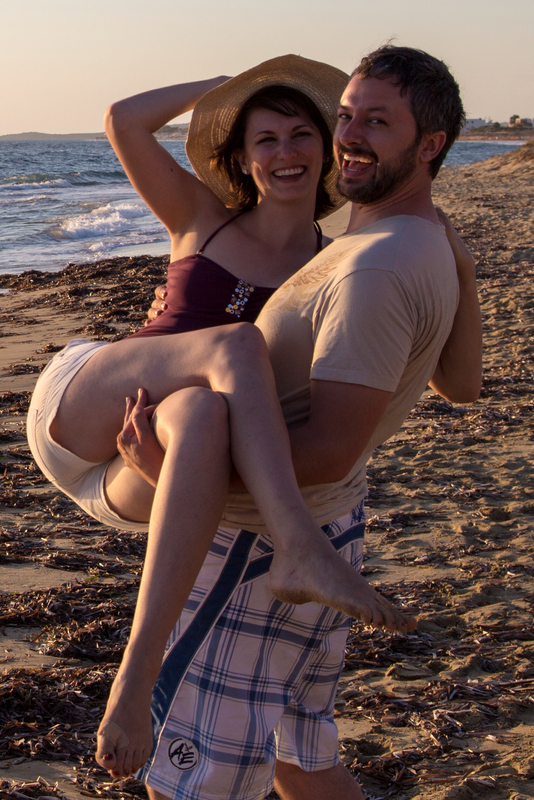 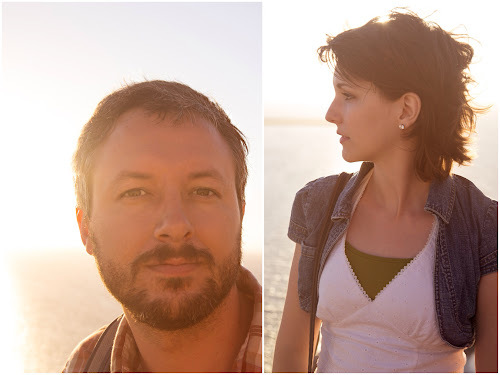 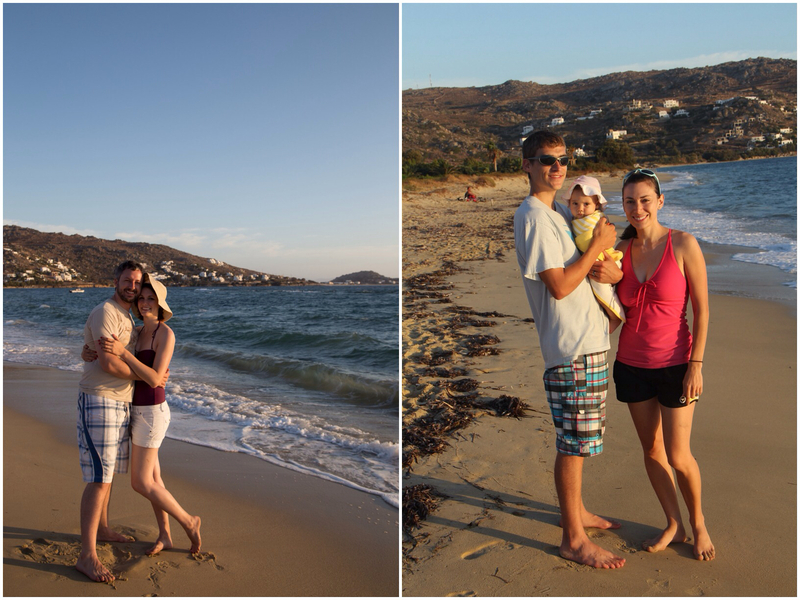 Chris and Michi weren't feeling well (possibly the result of the GIANT gyro the night before) so they opted to chill on the beach with the baby while Chris and I went exploring. 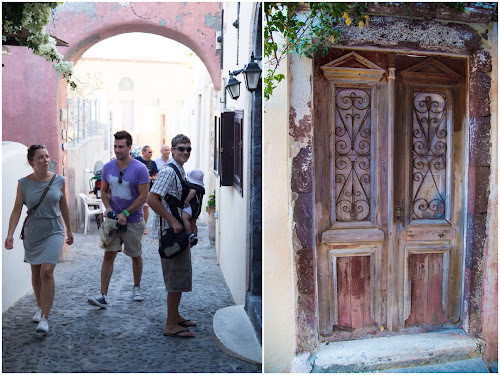 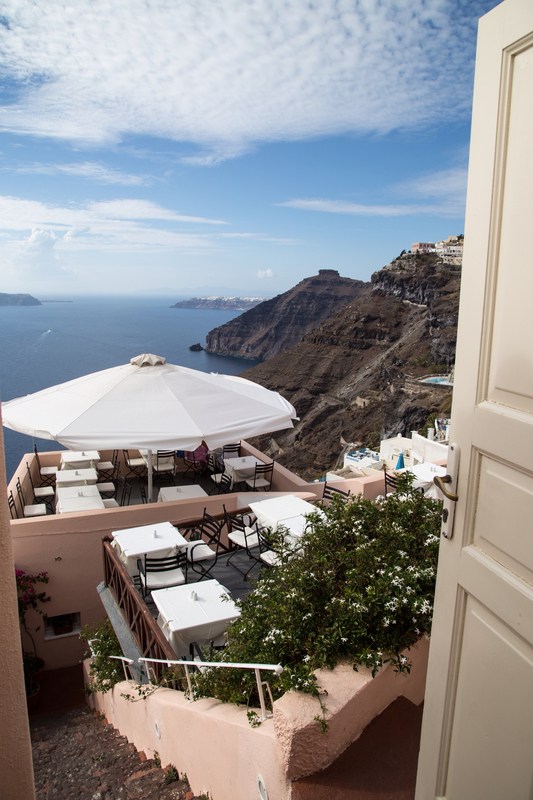 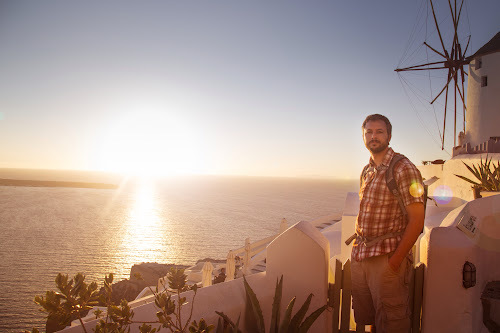 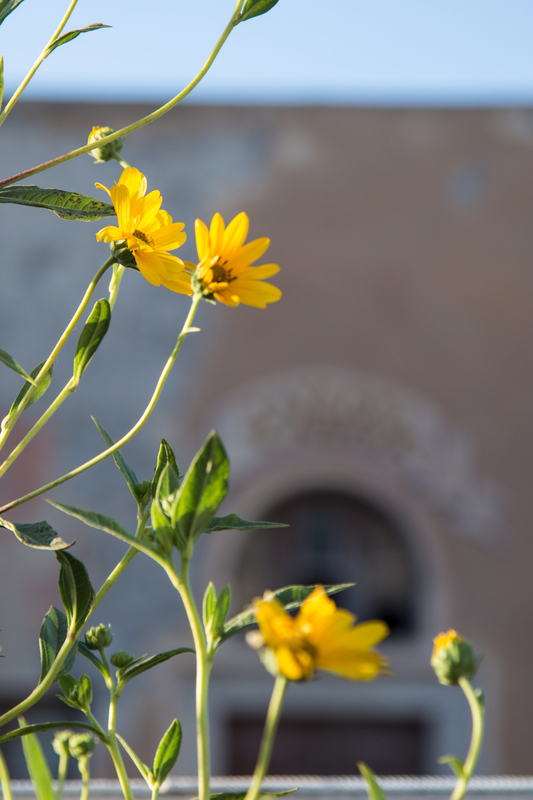 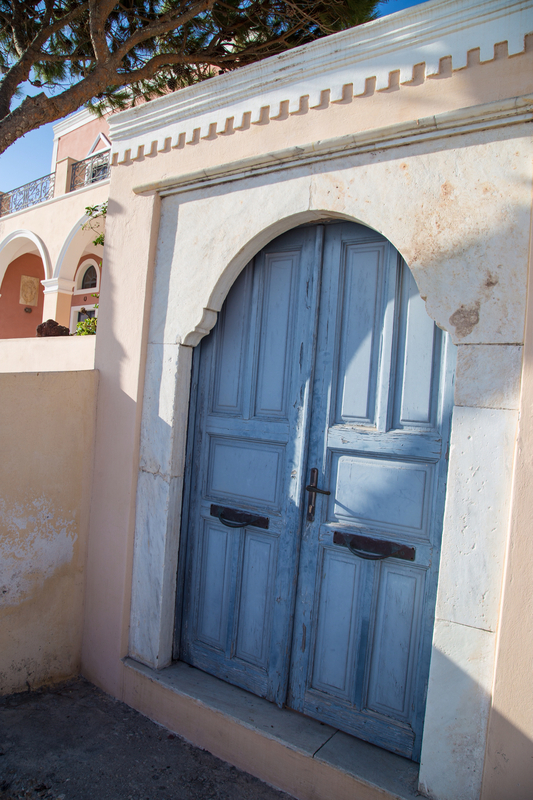 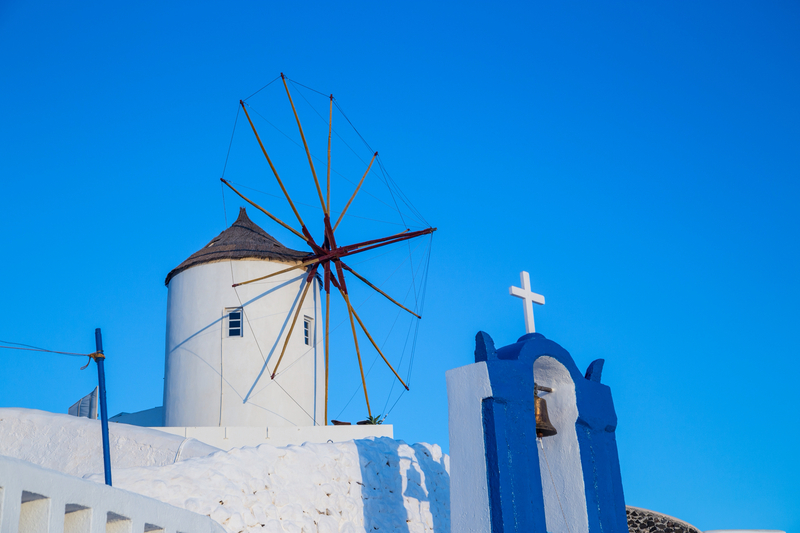 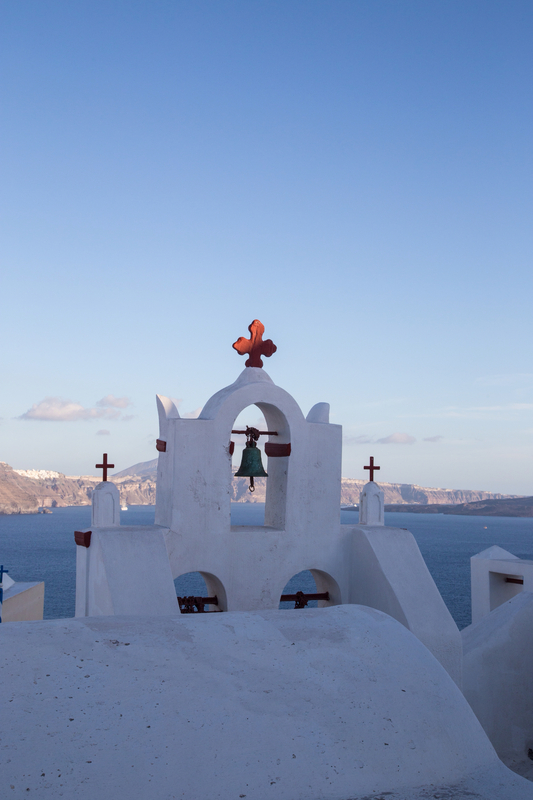 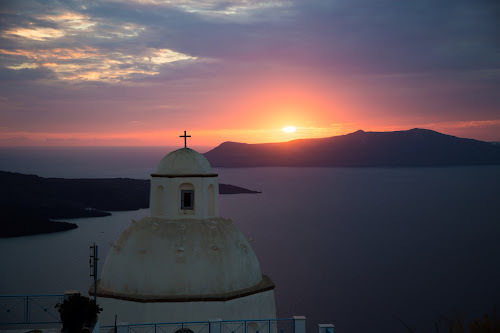 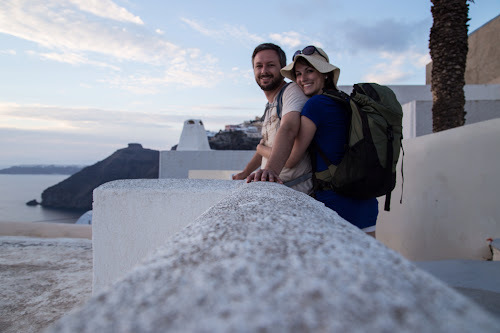 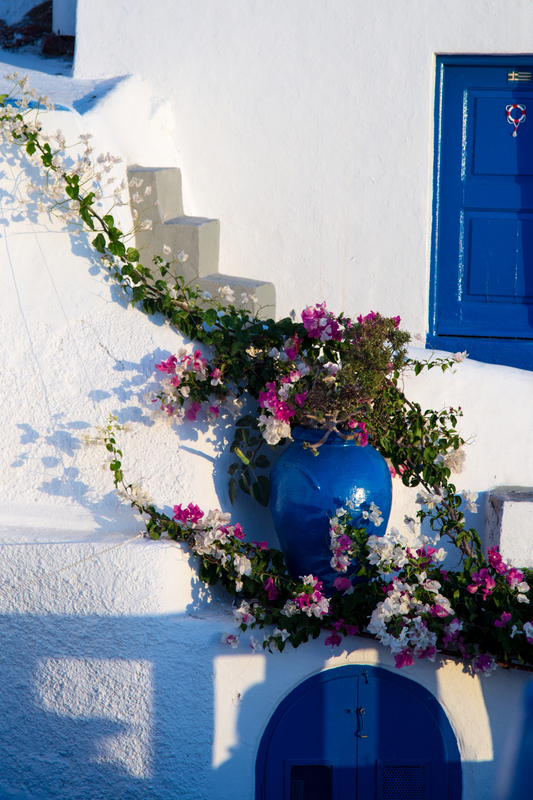 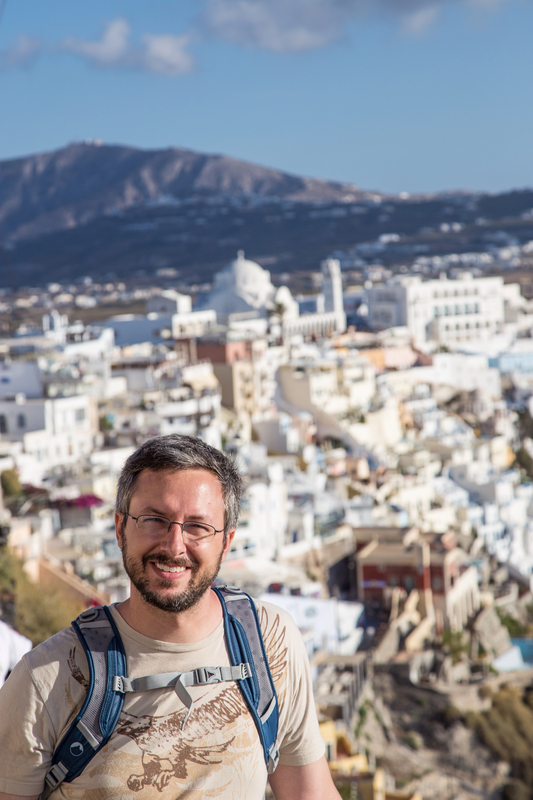 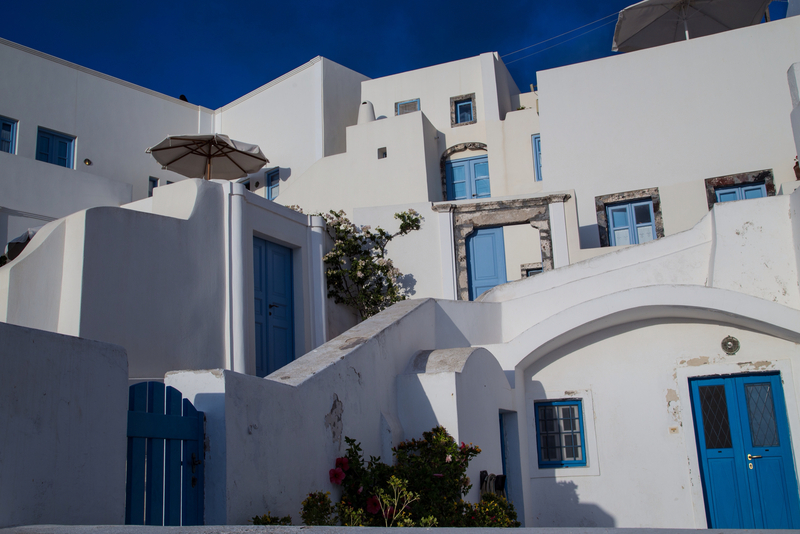 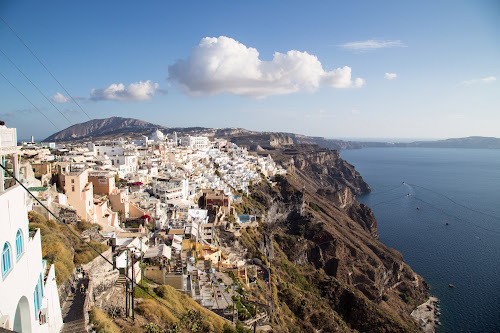 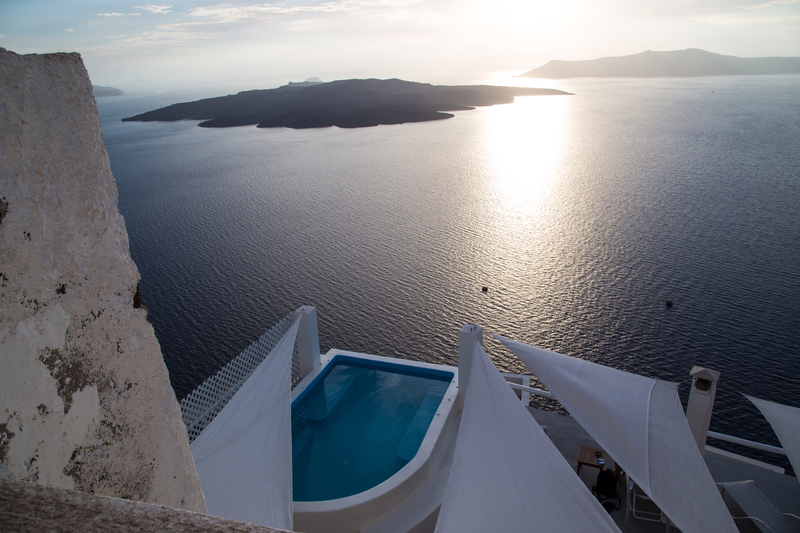 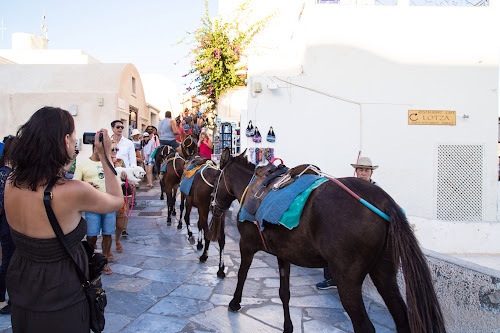 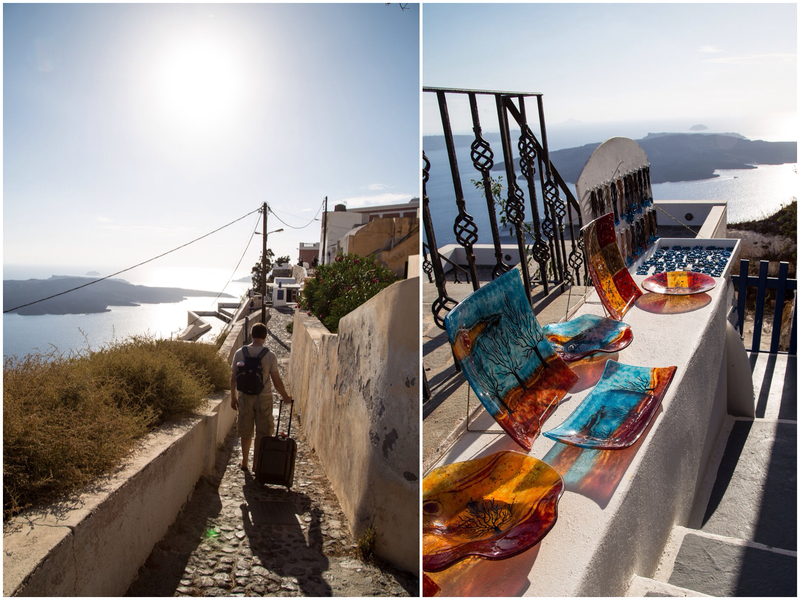 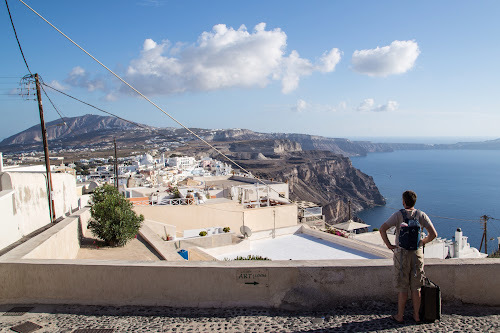 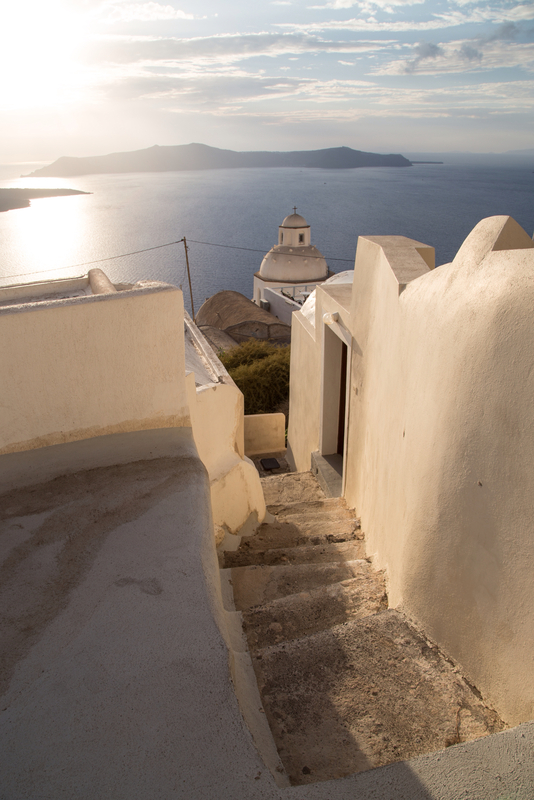 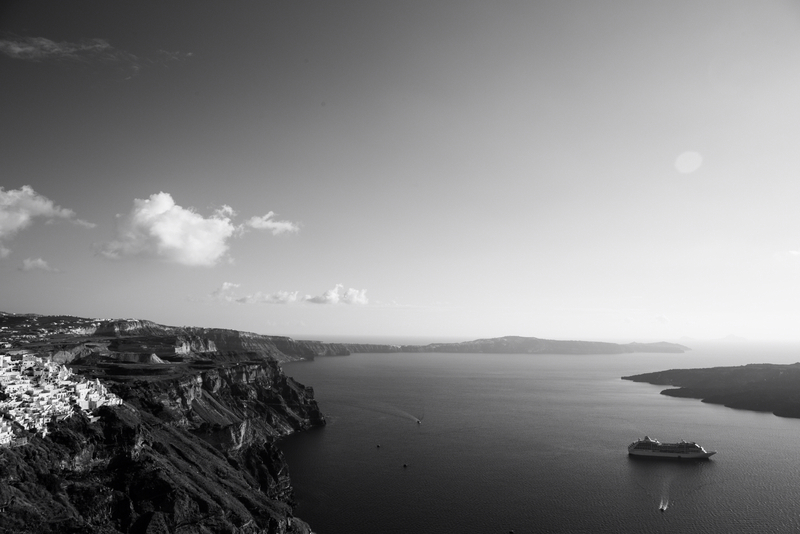 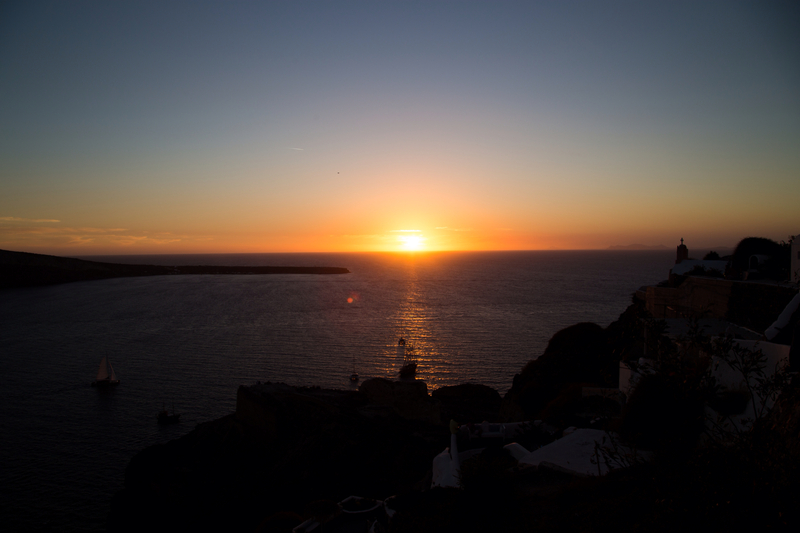 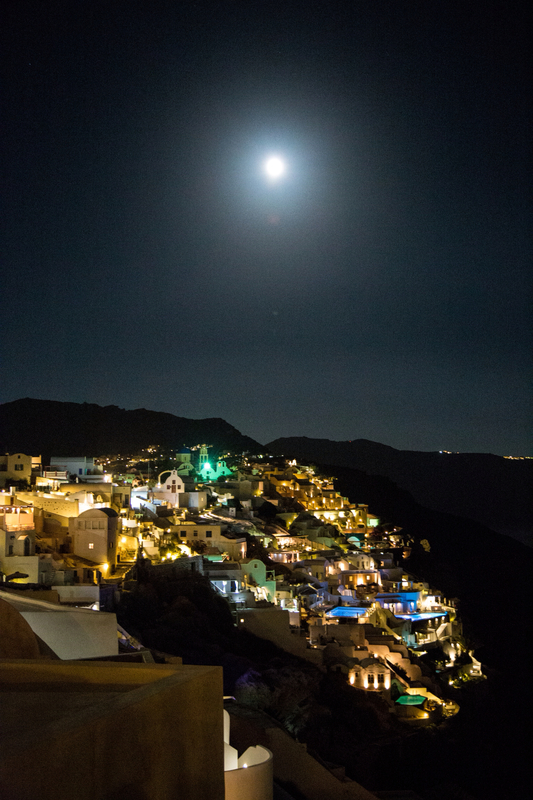 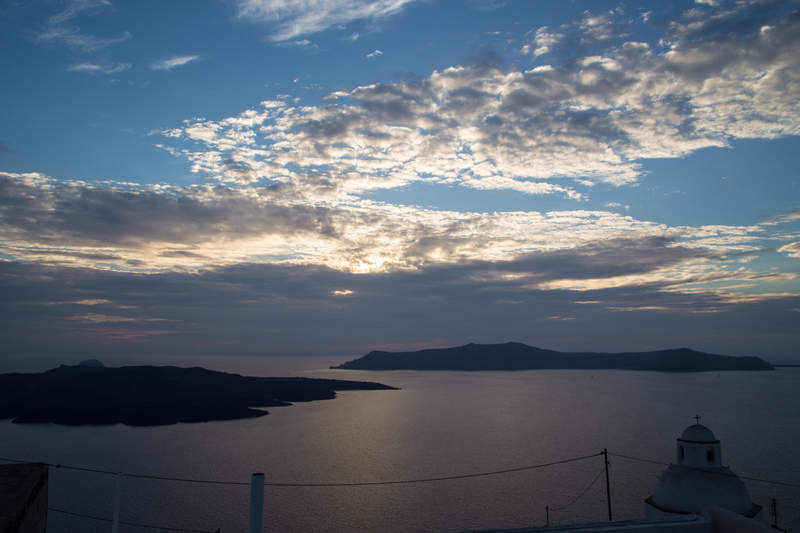 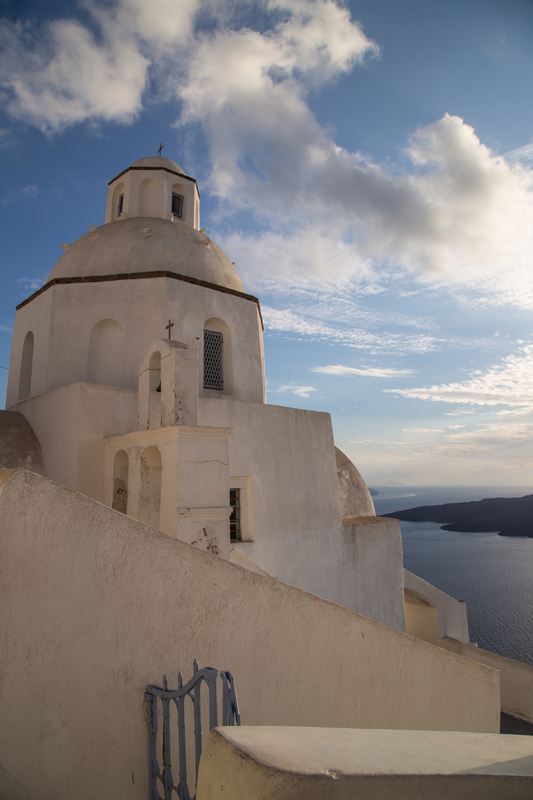 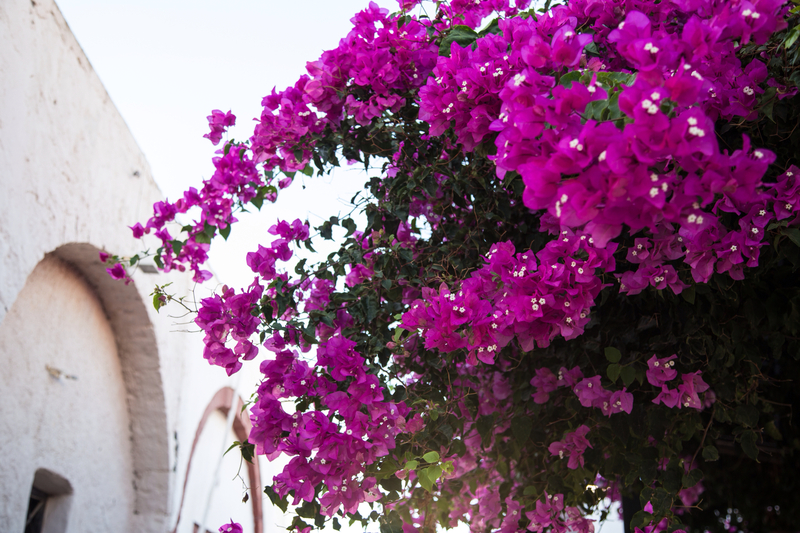 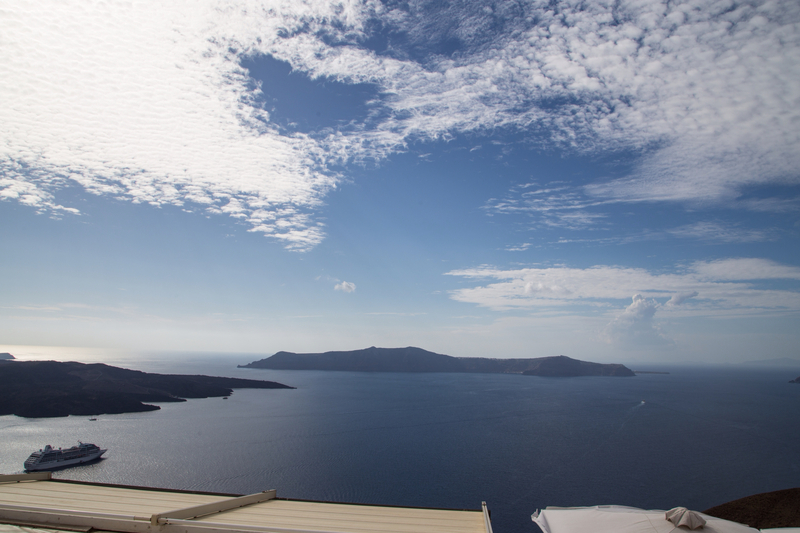 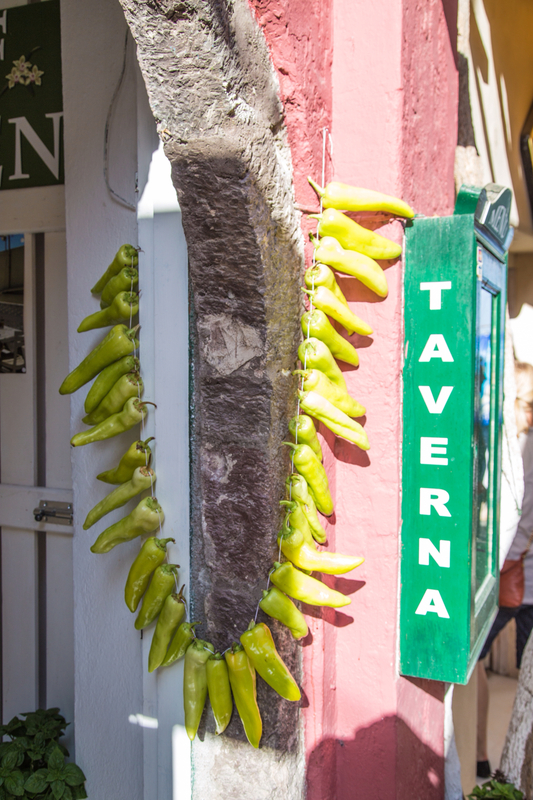 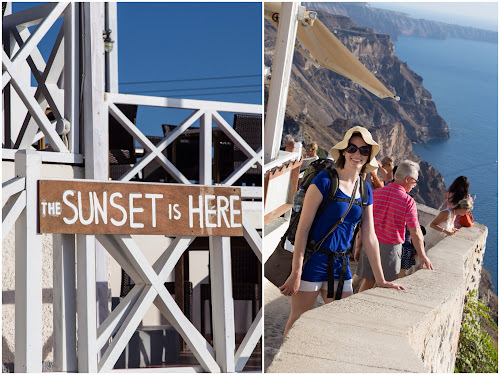 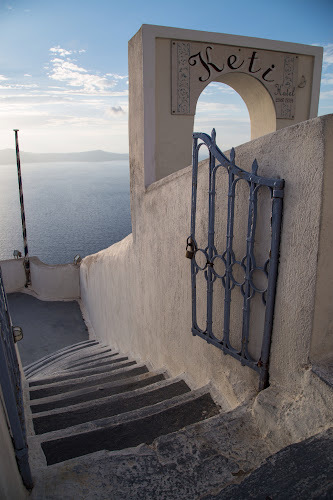 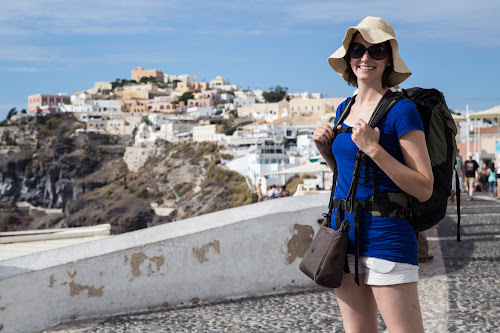 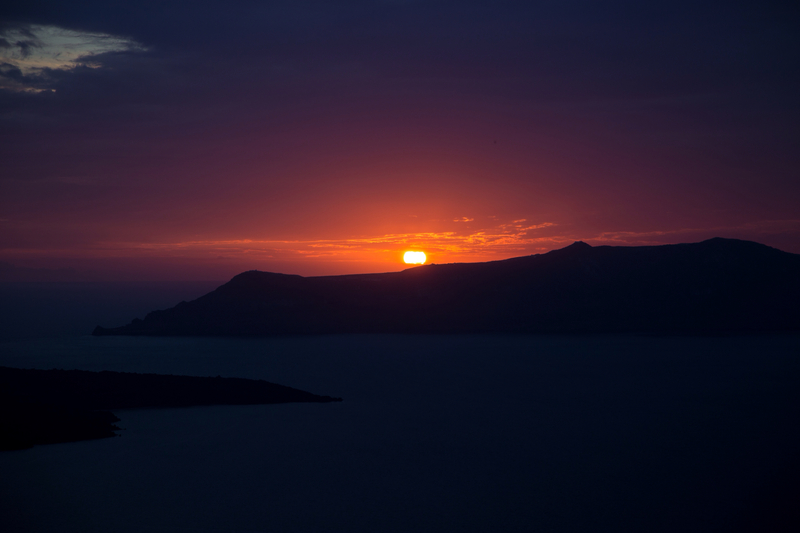 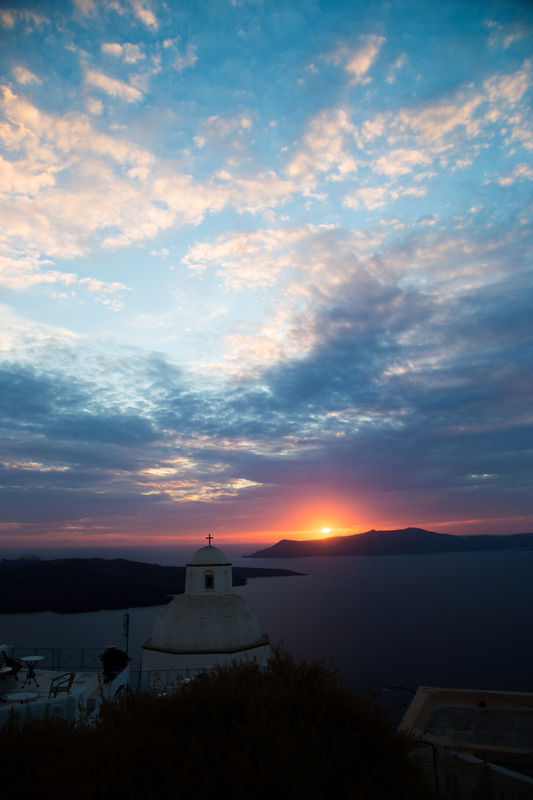 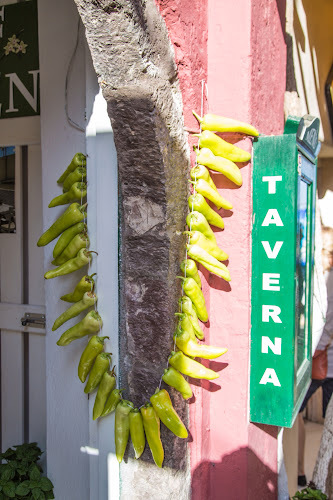 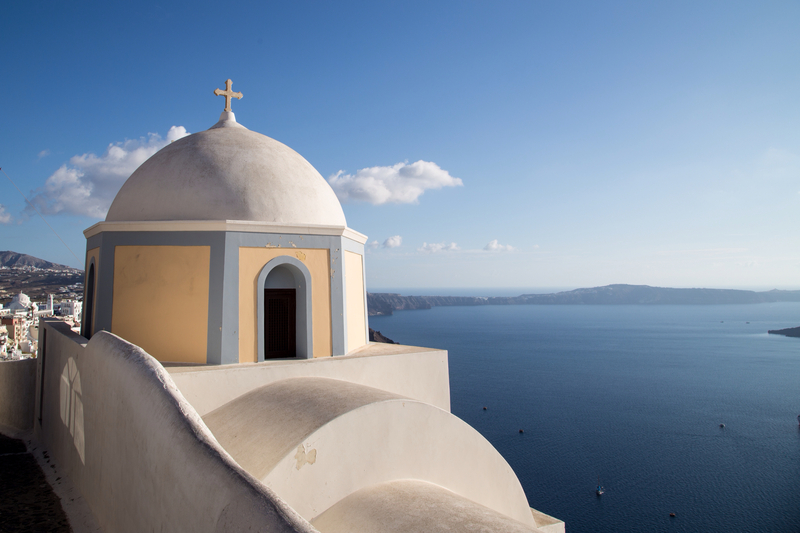 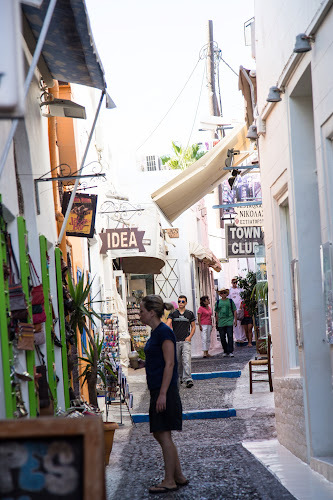 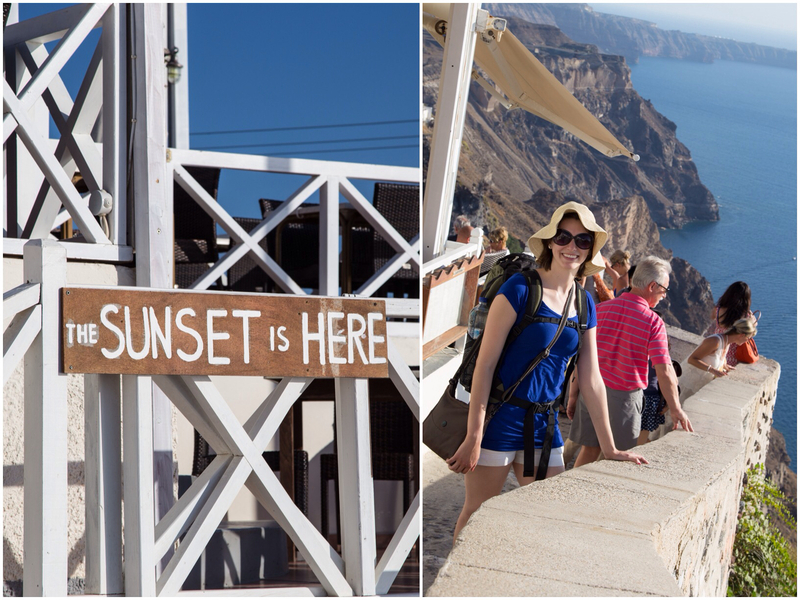 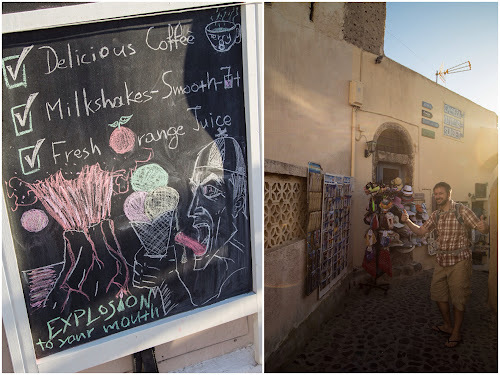 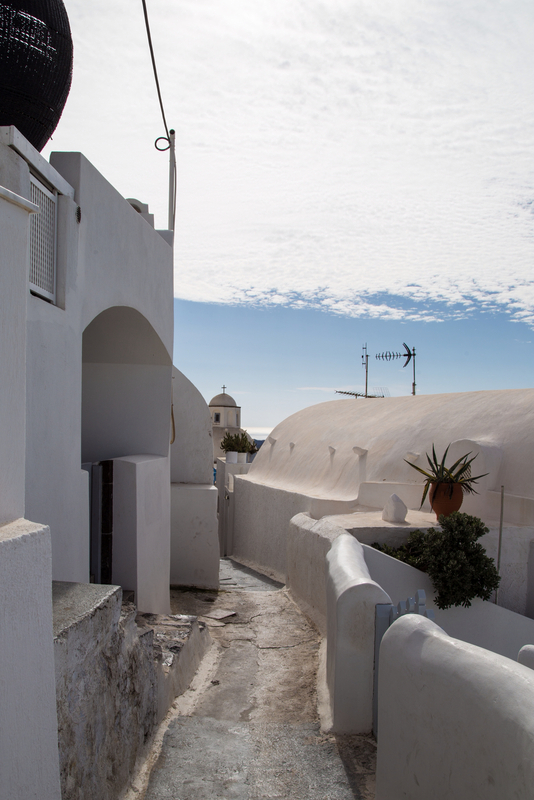 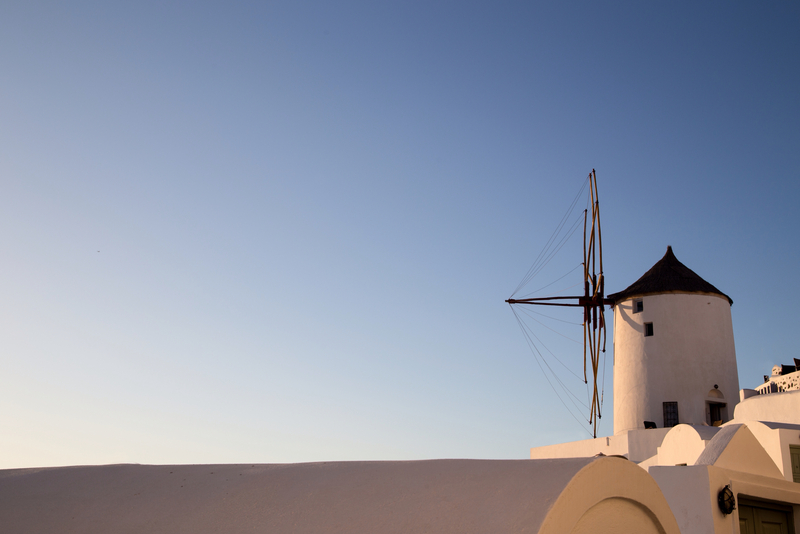 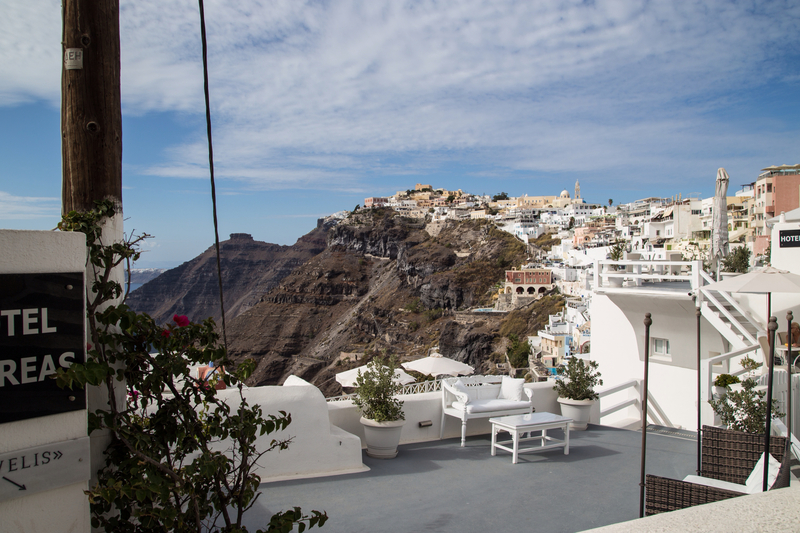 And oh boy…Santorini is an incredible place to go exploring! It's the equivalent of the McDonald's Playplace for adults. 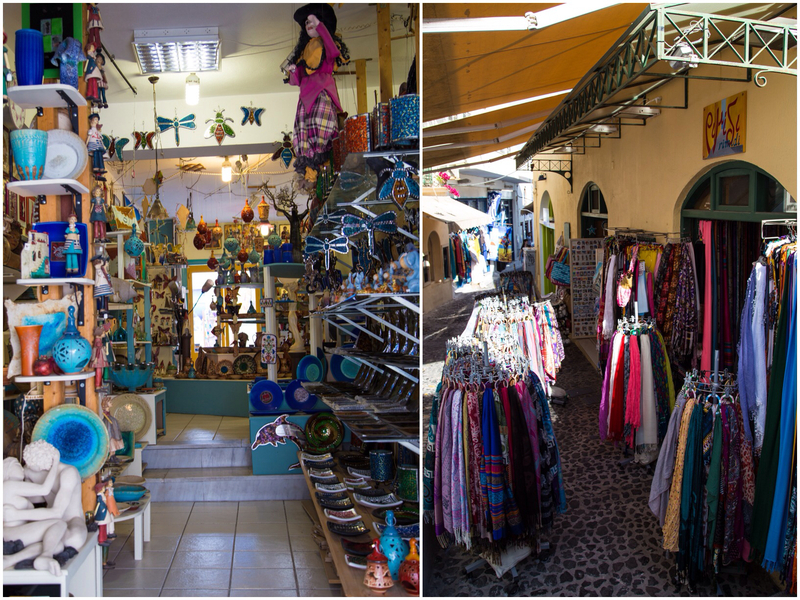 Colorful, winding streets, something new and exciting around every bend, I'm still a little obsessed! 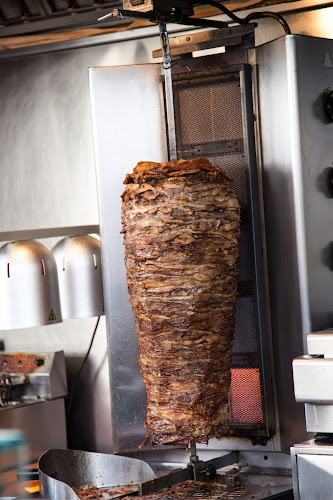 Mmm….gyro. Pretty much all we ate the whole trip. 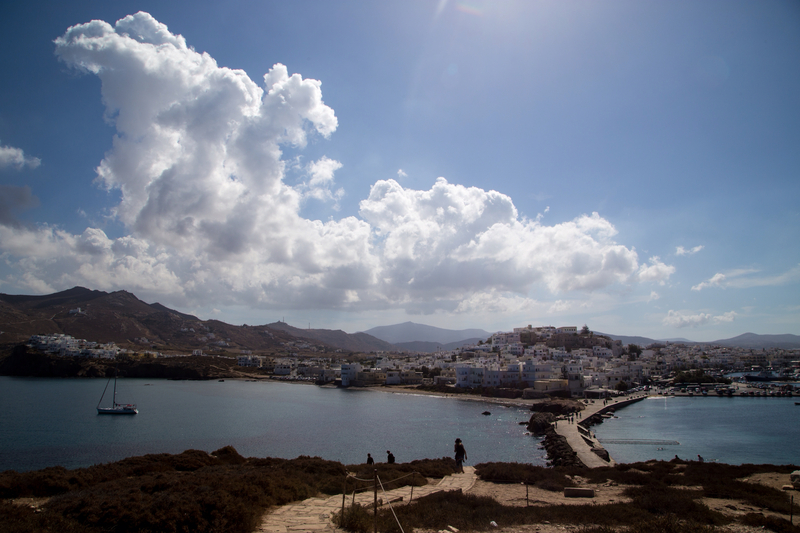 The view towards the other side of the island where we stayed. I could explore Santorini for years. 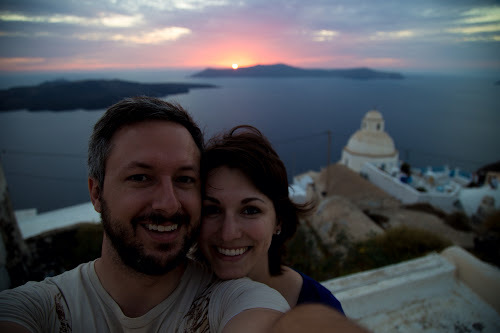 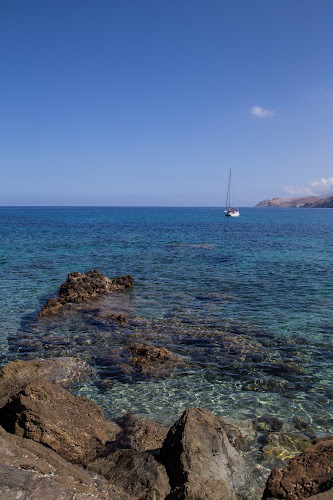 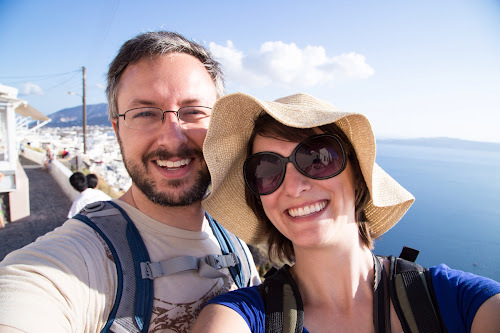 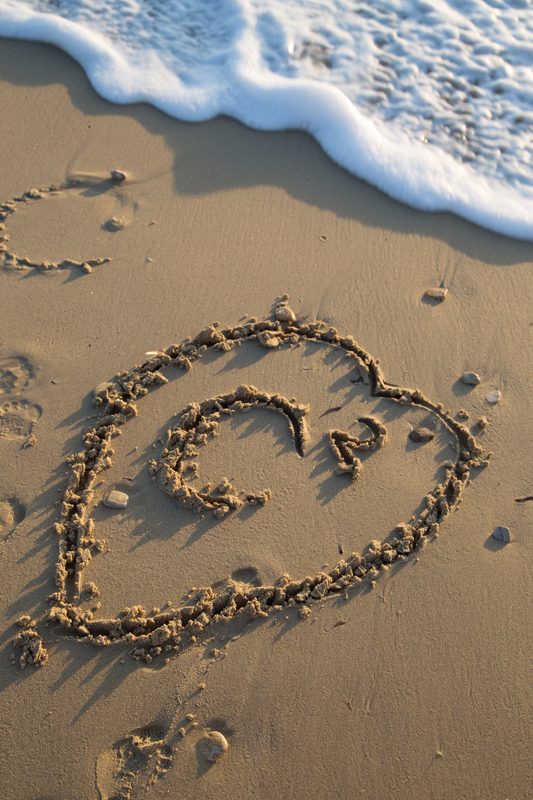 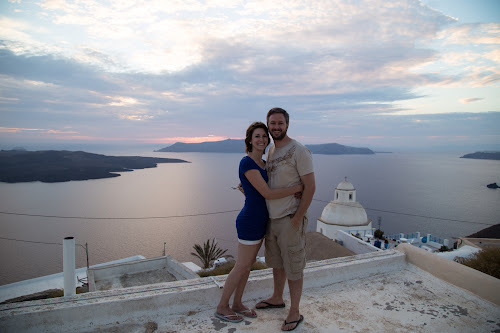 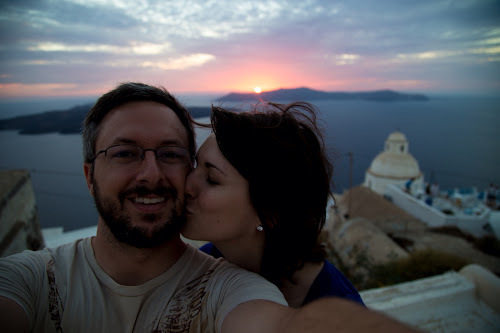 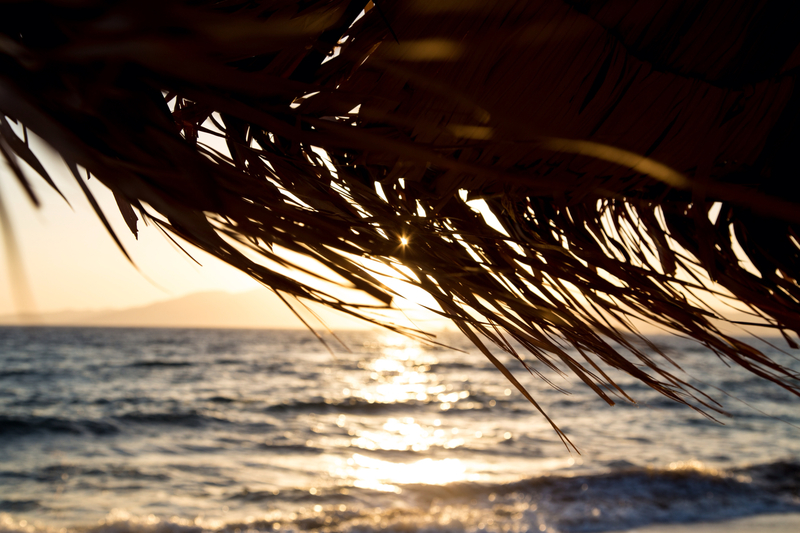 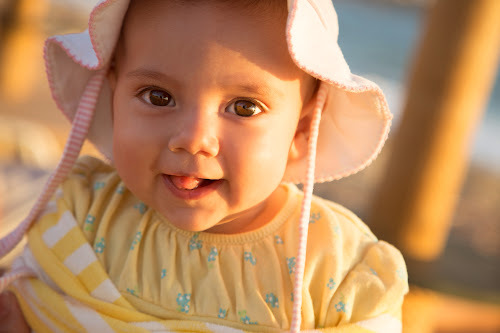 Next up on on our island-hopping adventure was Santorini! You can't really visit the Greek islands without going to Santorini. 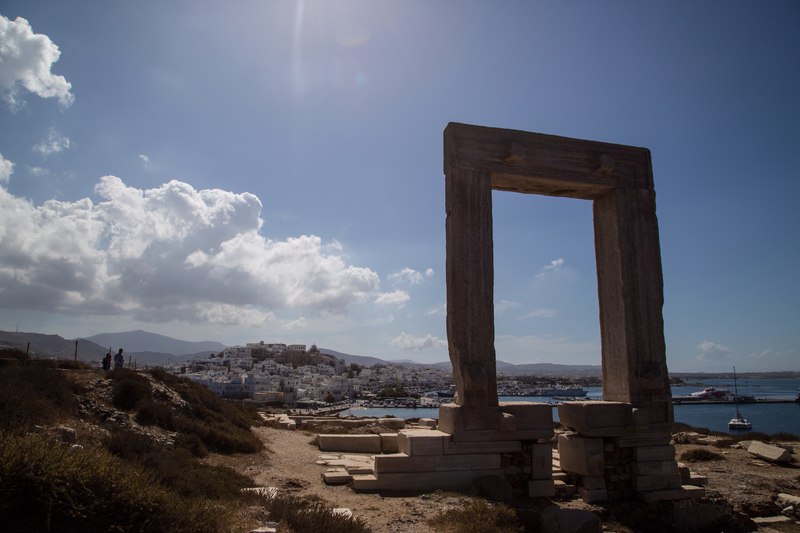 From what we've seen it's second only to the Acroplis as far as defining landmarks go. 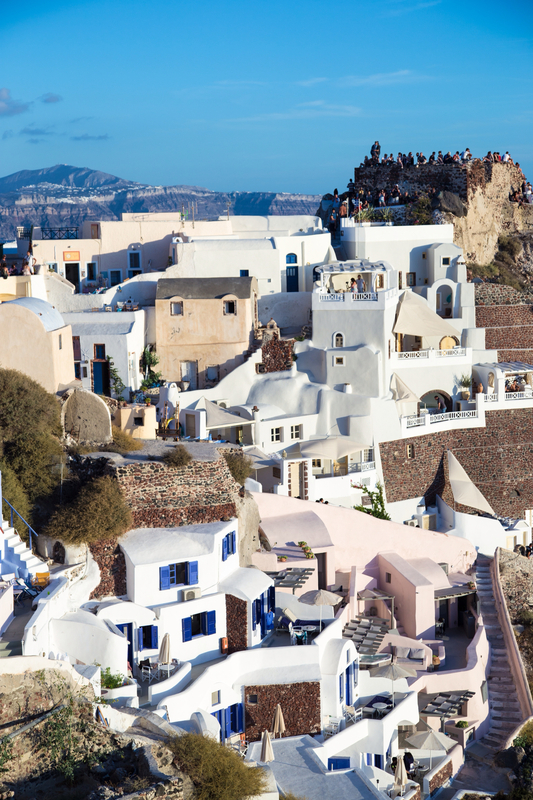 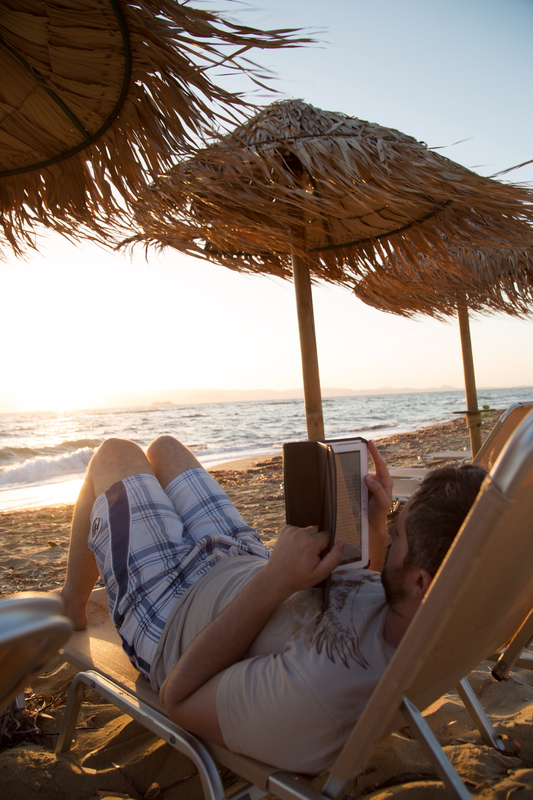 It's EXACTLY what you picture Greece to be too. 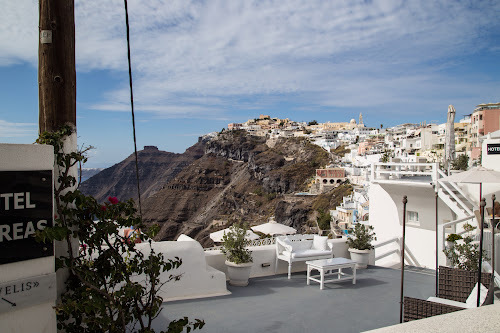 Bright white buildings clinging to cliffs with their cerulean blue roofs, windmills blowing in the sea breeze, and fresh seafood restaurants everywhere you turn. 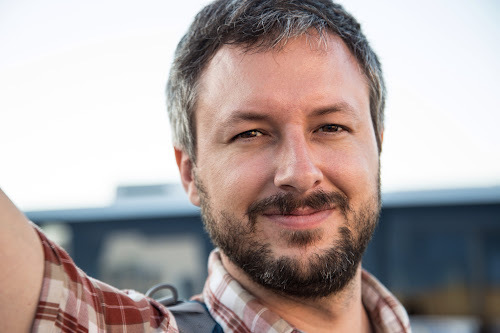 Only with more tourists than locals. 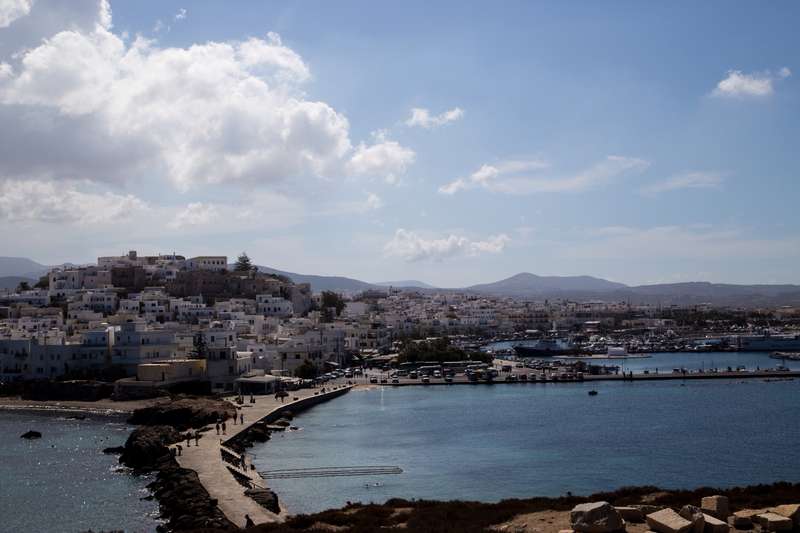 The ferry ride from Naxos was almost 3 hours, so we arrived just in time to find our hotel and start exploring before sunset. 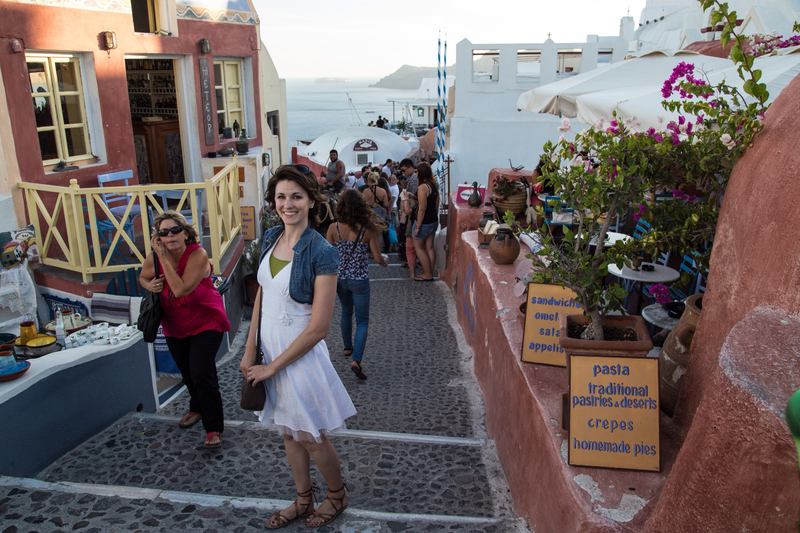 All the guidebooks (and tourist posters EVERYWHERE) said the town of Oia was the best place to watch the sunset, so that's where we headed for the evening. 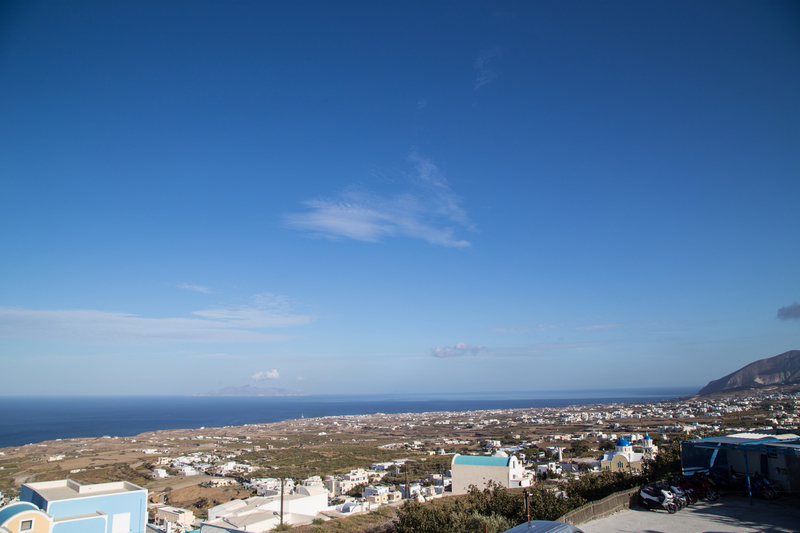 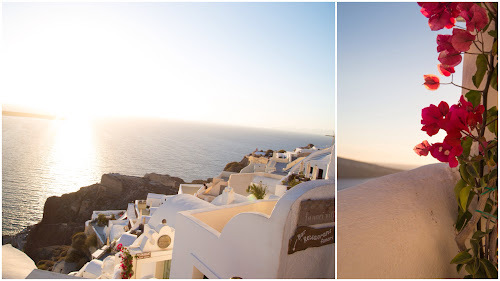 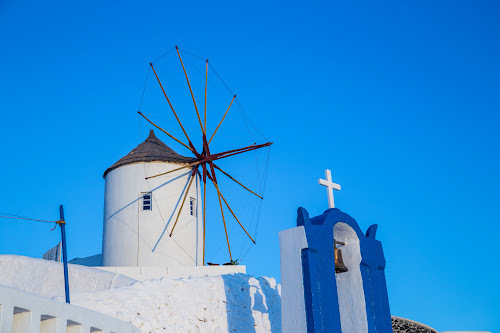 Oia is built right on the sheer cliffs overlooking the big sunken volcano that created Santorini. It was much more posh and ritzy than Naxos, definitely catering to the upper class tourists. 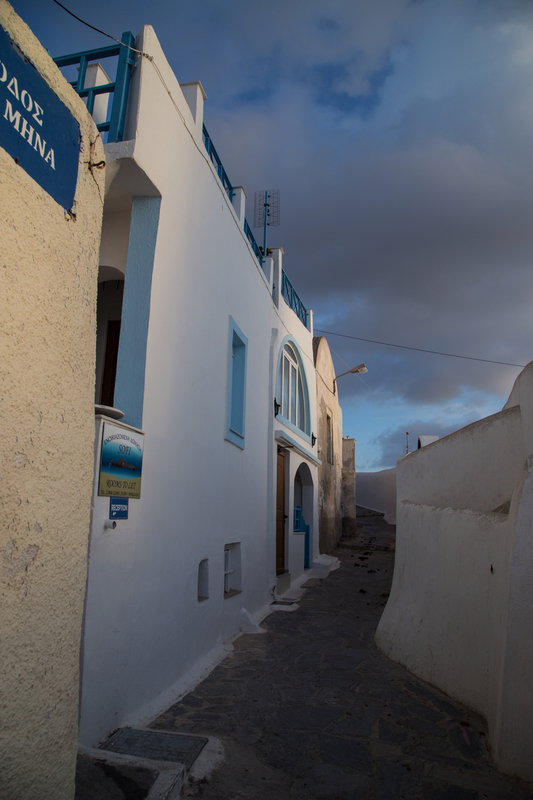 It was also much more crowded, particularly right before sunset. 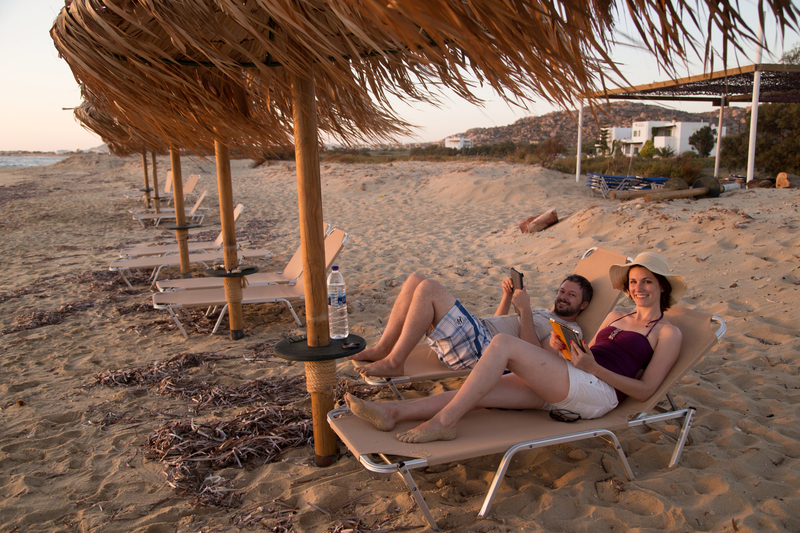 Looks like everyone else read the same guidebooks we did. Go figure. The town was spectacular though. 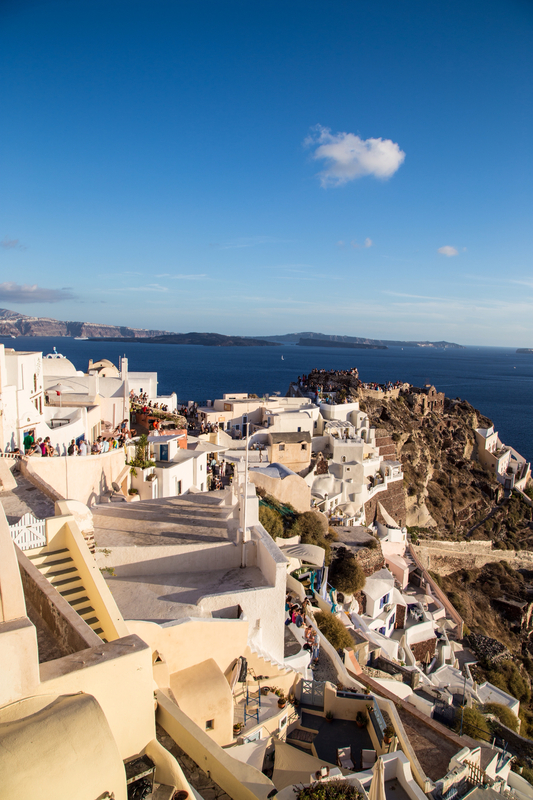 It looked just like all the postcards you see from Greece! And despite the crowds, it was a pretty cool place to watch the sunset! 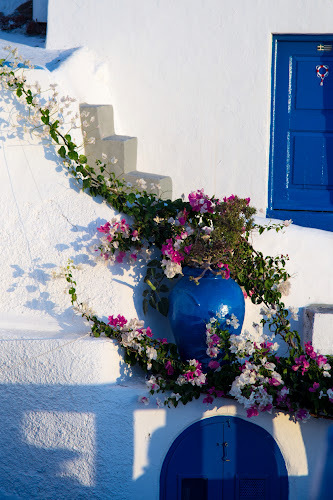 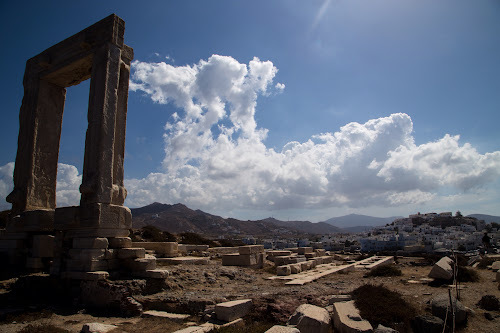 Ok… before we leave Naxos completely… here are just a few more shots from the morning we explored the port before catching the ferry to Santorini, just because I think they are beautiful! And because I can totally picture a wormhole portal opening up to another dimension within the Temple of Apollo ruins, can’t you?